For all bookings and enquiries, please contact us by phone or using the form below. 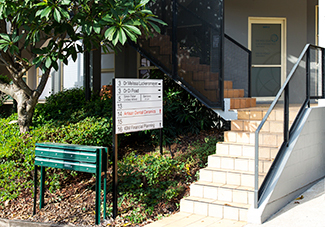 Dr Melissa Luckensmeyer’s rooms are located on the corner of Boundary St and Bradley St, Spring Hill, directly behind St Andrew’s War Memorial Hospital. The building is grey, and Suite 3 is accessed via Bradley Street. While on the ground floor, there is a half-flight of stairs to be negotiated. If you have a pram, or otherwise need wheelchair access, please let us know so that we can help you into the rooms through a rear entrance (no stairs). For parking you can use the St Andrew’s War Memorial Hospital car park (entrance on North St) for between $5–$20, or else you can find street parking around the rooms. There is plenty of metered parking in Bradley St, Boundary St, North St, Torrington St and Gregory Tce. Please come with coinage for the meters (max. charge: $8). Unfortunately, there is no on-site parking at the rooms. Once you are in the city, walk down the Queen St Mall and cross over Edward St. Part way along the block (past the Commonwealth Bank on the left), you will find Stop 56 which is clearly marked “Spring Hill Loop”. This is a free bus service which operates approximately every 10 mins and will take you directly to the rooms. Please disembark at Stop 182 (Boundary St) which is right behind St Andrew’s War Memorial Hospital, cross over Boundary St, and directly down into Bradley St. 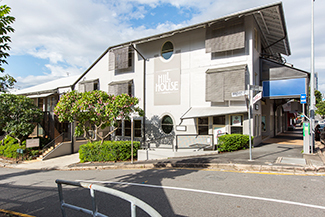 The rooms are accessed from Bradley St, on your right (big grey building). For a map of the Spring Hill Loop bus service, see here. For Brisbane bus services and timetables, see here. From Central Station, walk out onto Ann St and turn right into Edward St. You can hop aboard the Spring Hill Loop bus service at Stop 141 which is located part way along Edward St. This is a free service which will transport you directly to the rooms after a brief stop in Queen St to take on more passengers (see above for details). For Brisbane train services and timetables, see here.